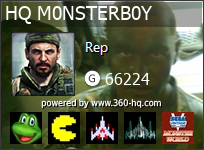 360-HQ.COM :: Why you should stay offline with a JTAG Xbox 360! Why you should stay offline with a JTAG Xbox 360! Post subject: Why you should stay offline with a JTAG Xbox 360! 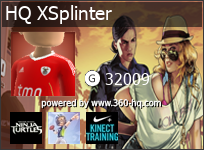 I have recently seen, more and more people buying Xbox 360's that have had the JTAG exploit done to the Xbox's. I personally think thats ridiculous for a number of reasons. Most people buy their JTAG Xbox 360's to go online with them or host whats called a 'Modern Warfare 2 Modded (Modified) Lobby', these Modern Warfare 2 Modded Lobbies are wrong for several reasons. First of all, it's cheating and second you are wasting a perfectly good keyvault (often known as KV). KeyVaults are very limited, and when you go online, they get banned within 1-4 hours. You may all be saying, who cares, I can just get another one. But the truth is, no, you can't. The only way you can get a keyvault is with a JTAG Xbox 360. XBox 360's are now manufactured with the latest dashboard and kernel update. Which means, they cannot be JTAG'ed. And no, there won't be another exploit for a while. Now you all may be thinking that you should try get more and more since they are limited. Every time you get a KeyVault banned. You are destroying the game modding community! I am sure most of you have seen or heard of Halo 3 Map Variant Mod's, with Master Chief and Elite clones on the maps or the Modern Warfare 2 Campaign Save mods, which can make you run faster and alot more. Any time you modify a single letter in the game save, it must be resigned. MS built the Xbox 360 so that games and game saves could not be modified, they did this by adding extra encryption that rely's on the KeyVault. So in a more basic way, they added more security to the Xbox 360, so we can't mod anything. Every time you modify a game save, it must be resigned or the game save will not be detected/allowed to play on the Xbox 360. The way we can resign these game saves, are with keyvault's. What happens when we have no more keyvault's to resign our game saves with? The good part is, a keyvault can not be banned if it is kept offline, although the content it resigned, does not contain enough information to get the keyvault banned. Which means we can keep the game modding community alive if you stay offline. So what I am trying to get to, is. If you are going online with a Xbox 360 JTAG, it's because of you that we will not be able to modify any game saves. You are one of the people that are destroying the game modding community, so STAY OFFLINE! If anyone has any comments, I would be glad to reply to them. Thanks bro. I personally don't mind the odd one, but that's all I see now. And half the people don't know anything about the JTAG exploit or the KeyVault. I tell you what I think: Anyone that goes to the XBL with a Jtag is stupid... You get banned in a hour. exactly, i feel the same man.. i can't believe all these guys wasting perfectly good JTAGs to host these modded lobbies. they are all only in it for the money man and yes it does hurt the game and 360 scene in full.. 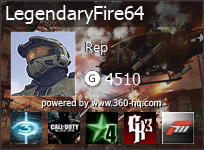 I hope your JTAG is still kicking legendary..
Yeah it is bro, and belive it or not but it seems to be getting better. Im new here and to Xbox in general so take it easy on me, Im just trying to understand. How do you get this KeyVault? 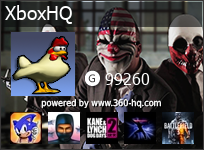 is it assigned to you when you go online or is something built into each xbox? Why would a person want to go through the trouble of doing the JTAG mod, going online and hosting the game only to be banned a few hours later? Microsoft can detect very easily that you console Nand is corrupted, it was changed so ban you very fast which is understandable. Every Xbox 360 has a keyvault, it's used to identify your 360... Also, because people are stupid now of days, thats why. because people are stupid now of days, thats why.